Rising before dawn prompts many questions; why am I awake again, whose idea was this, and will there be coffee? Fortunately for me and the hundred or so early risers in attendance, the impressive line-up of entertainment and presence of a coffee van in the Lawn Woods served as a welcome reminder of why we were there. 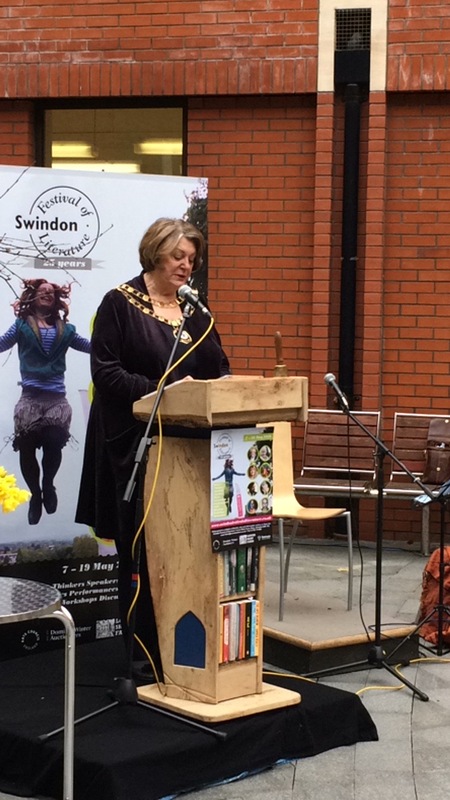 For, it was, of course, the launch of the twenty-fifth Swindon Festival of Literature, and the Dawn Chorus is an integral part of the carefully curated programme, as are the authors who attend. 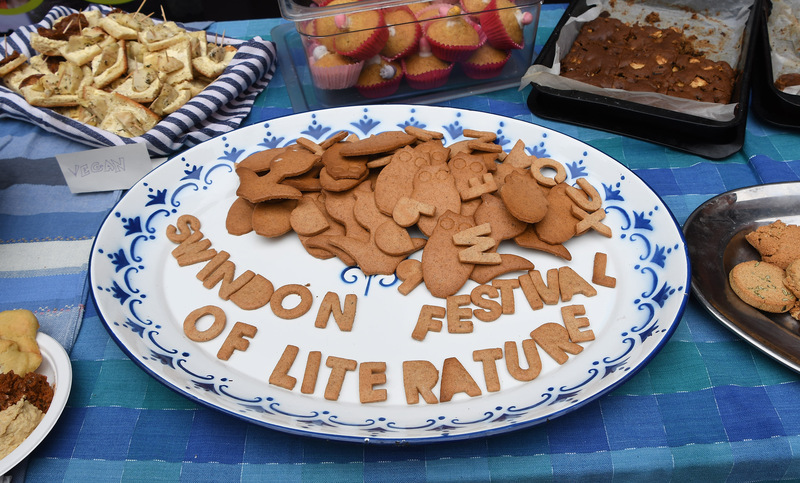 Food has always been big with the Swindon Festival of Literature Festival launch. 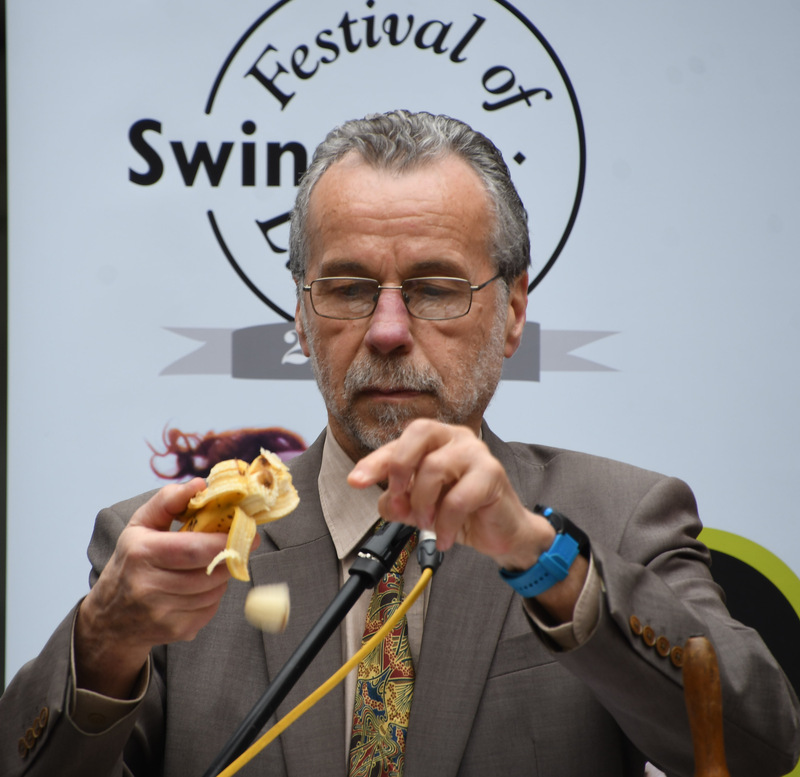 So alongside the festival’s name spelled in aromatic ginger biscuits and other home-made grub which hungry attendees decended upon, there was some magic with a banana. Since its launch in 1994, over twenty-five years festival director Matt Holland has grown the festival’s pamphlet of ten events into a programme of fifty authors. It all for started in Swindon’s Town Hall for Alison Bruce – then Lansdown – at a film-writing course. “I like the idea, but you need to write a book first,” was the tutor’s instructions. So Alison went away and wrote her third book; well, her first, but it was like Star Wars where the first turned into the third in the seven book series. I knew Alison in the 1980s when she was a presenter on local radio, presenting a rock and roll show. Swindon’s greatest intellects clashed on Friday night, at the seventh annual Think Slam. Over three gruelling rounds, seven competitors did mental battle in the Swindon Festival of Literature competition run in association with the Swindon Philosophical Society. Brian Blessed is going into Space. This is a good thing, as it is probably the only place large enough to accommodate his personality. Certainly the stage of Swindon Arts Centre cannot not hold him.